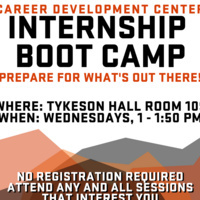 February 13th is our fifth of six events in the Internship Boot Camp series. Students can attend any of the events and no registration is required. The “Interviewing” event consists of practicing your interviewing skills. It is important to research the position and the company you wish to intern for. Come learn more about building your interview skills for that big day.